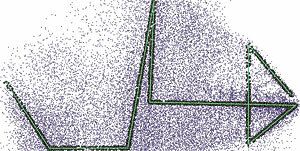 Top view of a slice of points shown in purple, and the resultant fence presented as a colored line in the center of the input points. A new Python toolbox available from ArcGIS Online provides three tools that enable geostatistical analysis of vertical slices from 3D point samples. These tools transform slices, rotating them 90 degrees to a horizontal 2D plane and performing geoanalysis. For years, ArcGIS users have been able to perform sophisticated geostatistical interpolation of data samples in two dimensions with the ArcGIS Geostatistical Analyst extension. Using this extension, they can take measurement data obtained at selected locations for a phenomenon and create continuous maps. Side view of the input slice points located on one side of the resultant fence. The points are measurements of oil in seawater after an oil spill. Natural phenomena—such as the gradient of air temperature, the content of an ore at various geologic strata, or the salinity of the ocean along adjacent vertical transect lines—can be described by 3D data. Studies of atmospheric cross-sections, geologic profiles, and bathymetric transects have become an integral part of GIS. The growing availability of 3D data and the popularity of its use for analysis has created a demand for geostatistical analysis capabilities for 3D data. 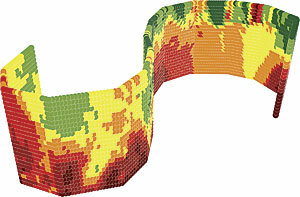 GIS is used to analyze not only natural but also man-made phenomena. For example, human impacts on air, earth, and water that can be analyzed in 3D include air pollution and oil spill plumes. Air pollution can migrate into the ground and be moved by groundwater drift. When an oil spill migrates from the bottom of an ocean to its surface, oil can sometimes be dragged by ocean currents. The need for greater insights in such occurrences to increase the understanding of these phenomena was the motivation for creating the 3D Fences Toolbox. 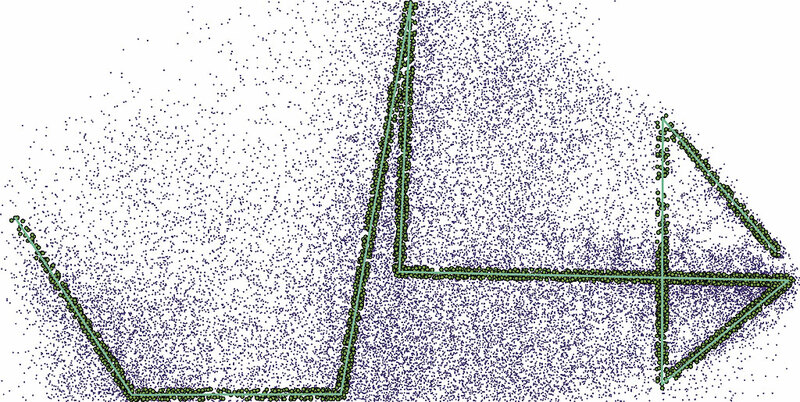 With the points displayed in ArcMap, open the Interactive Fence tool and draw a fence through areas that look interesting. With the Interactive Fence tool, the user can digitize multiple lines, even self-intersecting lines, and set the buffer distance from these lines. All points located within the buffer will be used for geostatistical analysis. To understand how the tools in the 3D Fences Toolbox work, you must understand two terms: slice and fence. A slice is a vertical subset of the 3D data analogous to a slice of bread from a loaf. While typically narrow in one dimension, it still is a 3D object. All the points in a slice are projected or pressed onto a 2D plane. In geology this is called a fence. The equivalent of a fence in the atmospheric sciences is usually referred to as a curtain. As an example, a fence can be used to illustrate a cross-section of geologic strata generated from an interpolation of the data coming from a linear array of vertical drillings. 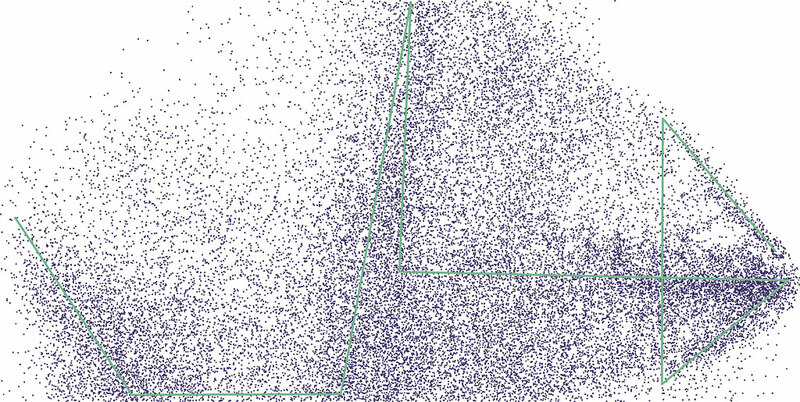 By running the tool, you can inspect the depth variation of points in areas of interest. The points that will be used for the geostatistical interpolation are shown in green. 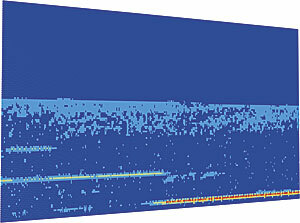 After running the tool, most of the variance in depth appears to be located on the east side of the sample. To better understand the phenomena, you could concentrate study in the area inside the circle or use fences parallel, rather than perpendicular, to depth. The tools in the 3D Fences Toolbox do not perform 3D interpolation and do not implement geostatistical analysis directly on vertical slices of 3D data. Instead, these tools transform a slice of 3D data containing x-, y-, and z-values that measure the phenomenon by rotating it 90 degrees to a horizontal 2D plane. Geostatistical interpolation using the Empirical Bayesian Kriging (EBK) is performed on these points in a horizontal 2D plane, which produces either a geostatistical surface of prediction or a map of the Prediction Standard Error. A geostatistical surface of prediction is a continuous map of the concentration or intensity of something, while a map of the Prediction Standard Error is a map of the degree of confidence in the prediction map at each location of the map. 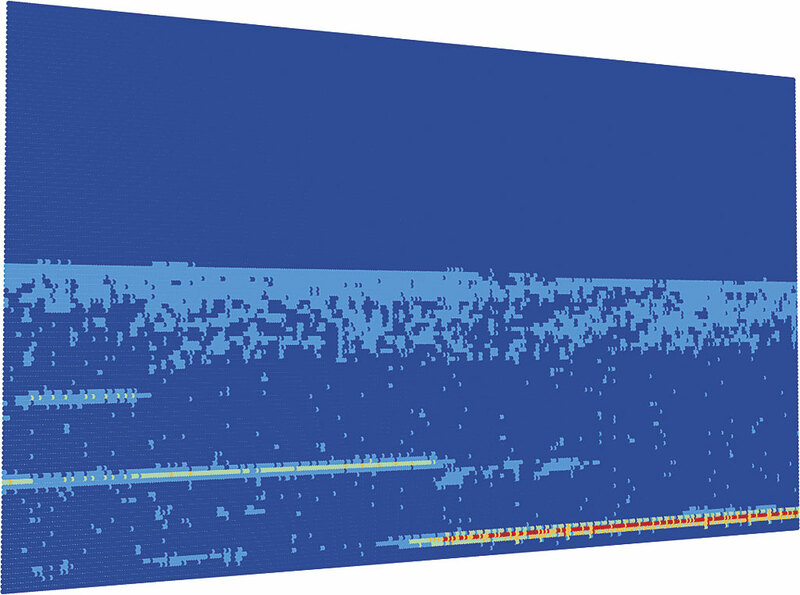 The 3D Fences Toolbox tools enable geostatistical analysis of phenomena such as oil spills. 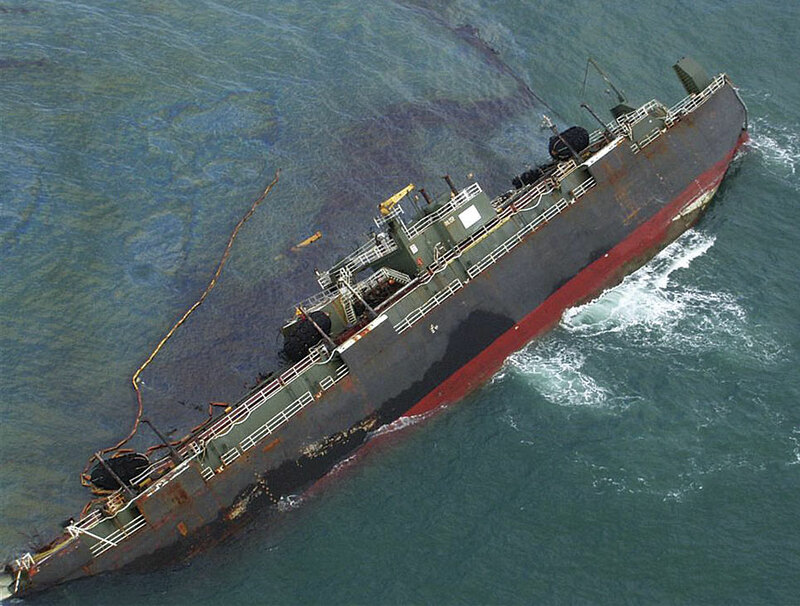 This photo shows oil leaking from a disabled vessel. Photo courtesy of ENTRIX, Inc. 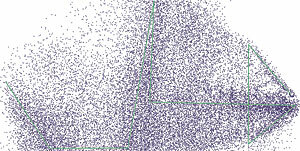 The resultant output from this transformation process is converted to a point dataset where the points represent the interpolated values at the center of each raster cell. The points are then placed back into the original coordinate space as a regular matrix of points resembling a fence. The fence is positioned in the center of the selected points of the initial slice when displayed in ArcScene (a module of the ArcGIS 3D Analyst extension) or in ArcGIS Pro. The raster is converted to a point dataset because ArcGIS does not currently support display of raster data as a vertical plane. In addition, point symbology options provide added flexibility in displaying results. Any ArcGIS standard or geostatistical point interpolation tool could have been implemented in the 3D Fences Toolbox. However, for the prototype, EBK was chosen because it is the geostatistical method known for its best-fitting default parameters and accurate predictions. Motivated, Python-savvy users can easily change the interpolation method employed by the tools if input data warrants the use of a different method. A fence created along a digitized "S" shape. The 3D Fences Toolbox consists of three separate tools that support different methods of generating fences. The Parallel Fences tool can generate sets of parallel fences in directions that are related to either longitudes, latitudes, or depths. In other words, the output sets of parallel fences can stretch from north to south, from west to east, or through the z dimension. The number of fences in each set is determined by the user. All tools support selection sets to create fences from a subset of sample point features. The Interactive Fences tool can generate fences based on lines digitized on the map. The user sets the buffer distance from the digitized line, and all points located within the buffer will be used for the geostatistical analysis. The user may digitize multiple lines and even self-intersecting lines with many vertices. An example of an atmospheric curtain created from backscatter data acquired by NASA from its Calipso satellite orbiting at 32 kilometers above the earth's surface. The Feature Based Fences tool creates fences based on existing features in a polyline feature. 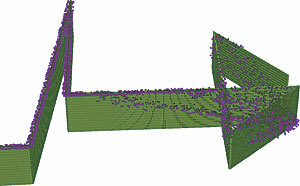 In this case, the fence shape is determined by the existing feature(s) and extends through the z dimension of the selected sample points. For example, this tool might be applied to detect oil leaks above an oil pipeline located on the seafloor. All tools contain options that enable the user to determine the minimum number of sample points and fence size required to generate a reasonable geostatistical surface. The tools are also time aware. If the sample data contains a date-time field and the option is enabled, a fence will be generated for each time interval if the samples for that interval and location meet the minimum requirements set by the user. The resultant fences representing consecutive time windows are positioned at the same locations to enable better visual analysis; these fences should be displayed as time animations. Download the 3D Fences Toolbox.